Historians, collectors and reenactors are well aware that mid-19th century Federal military regulations required most leather equipment and accouterments to be dyed black in color. But why? And, just how was it done? Moreover, if black was the finish color of regulation then why do surviving Civil War time accouterments display a wide variety of colors from black to chocolate brown? How did that happen? One might naturally fault military leather contractors, inadequate dyes or possibly the effects of time on these artifacts. However, the real answer to all of these questions is more interesting, chemically complex and often cloaked in the secrecy of ancient artistic privilege.Long before the leather was dyed and finished an intricate, laborious, multi-step process of approximately six months was required to tan the animal hide into leather. In the 19th century the “vegetable tanning” method was more commonly used and achieved by repeat soakings of the raw hide in solutions made from the bark of trees mixed with natural and other ingredients which generate an acidic chemical reaction that slowly turns the hides into leather. The “tannin” (tanning agents) found in the bark is the central ingredient that preserves the hide- first by stopping natural decay then leaving the leather both flexible yet durable enough for extended use. Bark taken from Chestnut Oak and Hemlock trees were the two most commonly used by American tanners of the time. Chestnut Oak (oak tanned) leather was mandated by the Federal War Department during the war because of its more acidic nature which aided the tanning process and perhaps more importantly, for its ability to bond with and hold the black leather dyes. 1844 belt of white buff. Black was the color of regulation by the Federal Ordnance Department for several reasons. First, the early influence of European armies, especially the French who used black accouterments, cannot be over looked. On a more practical note, black will hide stains to the leather, was easier to clean and could be buffed to an attractive shine. Most important, leather finishes such as dyes were used to help stop the damaging effects of wetting and drying from constant exposure to the elements inherent with the service of military equipment. So, how was leather dyed black? Historians have naturally assumed the formula found in the 1861 Ordnance Manual was the pervasive recipe for military equipments. However, this formula was never meant for dyeing sleeked leather. It in fact, lacks the necessary ingredients to chemically bond the tannin to turn vegetable tanned leather to black. In practice, this recipe was only intended as a re-blacking or touching up formula for mineral tanned buff leather and in effect, little more than a good quality black ink. The use of the word, “dye” is a bit misleading too. In actuality, the process of coloring vegetable tanned leather to black is a chemical reaction between iron mordants, logwood and the tanning agent used in leather during the tanning process. Iron mordants are particles of iron often mixed with mild acids such as vinegar. Logwood is vegetable matter that acts as a natural dyeing agent to get the blue black iron mordants to turn a deep, rich black. Tanning agents are residue from plants essential in the process to preserve hides into leather. As noted above, for most military usage leather this tanning agent (in vegetable tanning) was usually the bark from oak trees. Careful and often secretive preparation of the leather at the tannery including the right balance of the above ingredients, will determine the quality of both the leather, the black color and how long each will last. 1. After the long laborious bark tanning of the hide, the leather was then “finished” which included various additives, polishing and usually, staining or dyeing. To dye black leather, “curriers” (tannery specialists) generally used two basic dye formulas and a multi-step preparation process often enhanced with their own secret ingredients and methods. One of these recently re-discovered basic dye formulas consisted of “scraps of old rusted iron (are) deposited in a deep vessel and covered with sour beer, which is allowed to act upon them for three months. A red liquid is thus formed, which is a solution of acetate of iron. Another liquid may be made use of, which is less expensive and requires less time in the preparation. Sour beer is mixed with yeast from barley, and after twenty four hours, is added to a solution made by boiling copperas in vinegar, care being taken first to remove all the yeast from the surface. A mixture of solution of sulphate and of acetate of iron is thus formed.” 2. Using this formula or similar ones, the curriers then applied the dye to the leather, “while still on the table, being moistened before this operation, if it has become too dry, since a certain degree of humidity is necessary to enable it to receive the color. For this purpose, a mop of wool, or brush of horse-hair, is dipped in the (dye) composition prepared for the purpose,, and the hair side (smooth side of the leather) is thoroughly rubbed with it in every direction. Two applications of black are generally required for sleeked leather, and when any parts of the surface remain a red color, even a third may be requisite. When the leather is of a fine black color and perfectly dry, it is exposed to the action of a press for a time not longer than two weeks during which it is increased in density and firmness, the excess of tallow being forced out from it. …. A polish is given with sour beer or barberry juice, and the surface is slicked with a very smooth stretching iron or a lump of smooth glass.” . If any spot of grease or defects of surface remain, the parts which are thus deficient are gently rubbed with a cloth dipped in polishing liquid, until they become perfectly bright. 3. This process gives the leather a fine black surface and a good luster though not as highly polished as “patent” leather but a good shine nonetheless. Dying leather black was a precise process requiring great skill. Since the tanner was essentially working with acids proper applications of the chemicals and precise timing were required to prevent ruining the leather. “In staining blacks it is very necessary that plenty of the logwood infusion should be applied to the leather, especially if this is at all lightly tanned. Unless there is plenty of tanning and coloring matter to unite with the iron, the iron will combine with what there is of tannin matter in the leather, and render it brittle and liable to crack If too much iron is used, the leather may be completely ruined.” 4. Tanners usually made their own tanning solutions, finishes and dyes, however there were also a few commercial black dyes available on the market at the time albeit of questionable quality. “The most that can be said for the best “patent liquid grain” which is now sold is, that it is a great improvement, both as to quality and economy over the “home-made black”, made from pyrolignite of iron” 5. As can be seen, tanneries were in actuality, little more than specialized chemical factories. Tanners of the period did not have the advantage of product development laboratories, educated chemists or even PH scales as we do today but they nevertheless, held a keen understanding of acids and their dangers honed from centuries of experience. By the mid-nineteenth century hundreds, perhaps thousands of years of effort and experimentation had developed both the tanning and dyeing processes to a fine craftsmanship. For the individual tanneries, these processes were further refined and often closely guarded trade secrets. When applied properly, the result was wonderfully well tanned leather with deep black colors that have stood the test of time. 6. What about the chocolate brown colored leather often seen among other wise legitimate artifacts today? Why are they not black? These leather artifacts were made from hides tanned with Hemlock tree bark rather than the officially sanctioned and, correct Oak bark. Before leather was dyed and finished it was easy to tell the difference between Oak and Hemlock tanning. The two major barks strike unique, entirely different colors. Oak bark always leaves a yellow color whereas hemlock always leaves a reddish skin tone color. However, they further distinguished themselves when dyes were applied. “The most interesting aspect of Hemlock tanned leather and one that created enormous troubles for the Federal Ordnance Department during the war and for collector’s today, was the inert tendency for the dyes of Hemlock tanned leather to fade, often quickly, from black to brown.” 7. Unlike oak bark, hemlock bark tannin does not seriously bond with the iron mordants to change form and thus turn the leather black. After tanning, various specialty dyes were applied that will turn the leather black but usually only temporarily. Unfortunately, the logwood in the leather will eventually oxidize (sometimes very quickly), causing the iron to change form again and return the hemlock leather from black to the chocolate brown we often see today. Two 1864 dated Watertown Arsenal Federal cartridge boxes. The box on the left is Chestnut Oak tanned and still retains its dark black dye finish. The one on right is Hemlock tanned that was originally black but has returned to its signature brown. Fading will always result on Hemlock tanned leather regardless of the finish applied. Nevertheless, it is clear tanners routinely “cheated” and used hemlock tanning anyway. But why? Hemlock bark had a higher percentage of tannin than Oak and it thus shortened the overall tanning process by a month or more. Another advantage was that Hemlock tanned hides tended to be heavier and therefore brought more money because leather was sold by the pound (until about 1885) rather than by square feet as it is today. Simply put, Hemlock tanned leather was quicker and more profitable to produce but came with its own inherent dyeing problems. Due to the pressures of profit and demand, it is believed that throughout the war many unscrupulous tanners duped the over wrought Ordnance Department inspectors and delivered hemlock tanned leather manipulated to black- if only temporarily. 8. 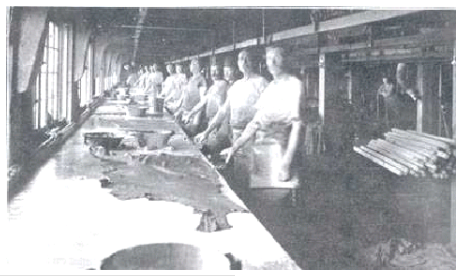 Tannery workers currying leather. Work in a 19th century tannery was tough, dirty business. Note the working conditions including having to work close to windows for the natural light they afforded and the inherent filth of the tanning process visible on the workers aprons. It is worth noting that a typical mid-19th century tannery could not exist today. Tanneries of the period were expansive operations usually found along a creek or river and employing dozens of workers. The process of tanning animal hides into leather was a dirty and dangerous business. Today’s environmental and work place laws would not permit the massive destruction of trees for bark tanning, unfiltered exposure to chemicals by employees and the prolific ground, water and air pollution caused by the leather tanning and dyeing process. Yet despite all of this there is something truly romantic about this lost art form. We cannot duplicate their fine craftsmanship and, we will likely never truly know the depth of their knowledge. However, we can admire their great resourcefulness, ingenuity and skills borne from thousands of years of toil and, fortunately, still enjoy some of their handiwork that survives today. Most accoutrements of the war time period were made with “sleeked leather”. The Federal cap box and cartridge box above are typical sleeked leather finishes applied to the grain side of the leather. A good shine, even after one hundred and forty years is evidence the tanner did his job well. “Sleeked” and “Waxed” are finishes applied to vegetable tanned leather. “Sleeked” leather as noted above was finished on the “smooth” or, “grain” side of the leather. “Waxed” leather was finished on the rough or flesh side however, the “blackening” finish for waxed leather was very different. Waxed leather was not dyed using iron mordants but instead lamp black, tallow and wax was mixed into the finish and carefully applied in multiple layers to completely conceal the rough flesh of the leather. This type of leather has a heavy finish which can show up in photos with a high, brilliant shine. The appeal of waxed leather was its beauty and its thick finish which allowed it to be repaired if scratched or damaged. Its disadvantage was that the lamp black cracks and breaks off with age. “Buff” leather went through the same initial beam house preparation as vegetable tanned leather but was then “mineral” tanned ( a totally different process). Buff leather has the grain surface destroyed during the extended liming and what is not removed is sanded off. This sanding process was called “buffing” and may be where the leather derives its name. For accoutrements, the leather was finished (dyed black or whitened) on the “rough” or “flesh” side. To dye buff to black, extracts of logwood, pulverized nut gall, copperas and rain water were mixed then carefully applied to dye the leather a deep black yet retain the rough finish. White buff was made white with the use of “Paris Whiting” or chalk powder. Correspondence of the period suggests ordnance officers were often confused about the complicated tanning and dye methods and their different applications for sleek, waxed and buff leathers and thus, relied upon the more experienced (and sometimes unscrupulous) leather tanners for direction. Sleeked, waxed and buff leather as used for American military accoutrements and horse equipment was generally made from high quality animal hides. All animal skins are technically classified in the following manner: “hides”; comprising the skins of oxen, horses, cows, bulls and buffalo; “Kips”: consisting of the skins of younger growth of the above animals and, “skins” or, small animals such as dogs, sheep, goats, hogs, seals, etc. “Waxed” leather was finished on the rough or flesh side rather than the grain side then dyed and finished with thick layers of lamp black, tallow and waxes to completely conceal the rough flesh of the leather. It could be buffed to a brilliant shine and was easily repaired if scratched or damaged however, its finish tends to crack and flake off with age as can be seen in this photo (left) of an original Federal belt loop. Both sides made waxed leather. On the right is a Confederate cap box also of waxed leather finish. Hides from large cattle and horses were best suited for making most leather although hides of other animals were routinely utilized for specific usages. For example, oxen were considered the best for sole and harness leather while cow and horse hides were often reserved for making high quality saddler’s leather. However, the hides of older cows that have repeatedly calved and lost their elasticity were considered inferior to that of younger heifers. Horse hides made good leather, thongs and belts. Goat skins for ladies shoes. Sheep skins make a spongy, weak leather primarily used for shoe and & boot linings, book binding and trunk trimmings. Goat and deer skins made excellent ladies shoes and gloves while hog skins were almost exclusively used for saddle seats. Bull hides are the least desirable of all being thinner and more flabby than those of oxen or cows but serviceable nonetheless. The nature of the animal’s health and food intake at the time of being killed had a large influence upon the quality of the hide and often the leather itself. Overworked, sick or lean animals or, hides deficient in hair were not well adapted for making good leather but were nonetheless used for lesser quality leather needs. The differences were not easily distinguished except by experienced tanners and thus hides were graded upon purchase. Hides of various kinds were imported from all over the globe in the mid-nineteenth century however, those from the northern latitudes (above the equator) were preferable to those from the South. Interestingly, cattle slaughtered in the colder months tended to give five percent or more leather than hides taken in the summer. As for size, large, heavy, dense and thick hides were chiefly employed for thick sole, belt and harness leather- the very largest were used in carriage tops. Smaller, lighter, high grade hides were saved for “bridle” and “skirting”(accoutrements, saddlery, etc), foot wear and other first class leathers. The thin hides of inferior calf skins or other “kip” skins were used in lessor efforts such as gloves, book bindings, etc. These “hides”, as they were generically called, were sent from the slaughter house or farm either “dried” and/or “salted” (green) to preserve them for transportation to market or “fresh” with no advance preparation. For shipping or storage, green “salted” hides were preferred by the tanner as the best means to preserve their integrity while preventing deterioration. Generally speaking, if a hide or skin was free from defects and had sufficient strength and thickness, good body and firm then it was presumed to tan well and would be earmarked to make good leather for some useful purpose. 9. About the authors: David Jarnagin is part owner of C & D Jarnagin the nation’s largest manufacturers of 18th and 19th century military reenactment clothing and equipment. For over twenty years David’s domain has been the company leather shop where they make authentic cartridge boxes, cap boxes, belts, bayonet scabbards, knapsacks, shoes and more. A passion for the study and experimentation with period leather tanning, dyeing, preservatives, equipment manufacture and of course, the handling of thousands of artifacts have made David uniquely qualified in the subject of 19th century leather processes and leather equipment. Ken R Knopp, is a financial advisor with Edward Jones Investments and the author of two books on Confederate saddlery, “Confederate Saddles & Horse Equipment” and “Made in the CSA, Saddle Makers of the Confederacy” as well as numerous articles about Civil War saddlery, leather and accoutrements. Author’s Note: The authors would like to thank collector/author Fred Gaede, Paul D Johnson, author of “Federal Cartridge Boxes” and Doug Kidd of Border Sates Leather for their gracious and immeasurable assistance in the research for this article. 4. Ibid, Pgs. 181, 172. 5. Professor H Dussance, Chemist, A New and Complete Treatise on the Arts of Tanning, Currying and Leather Dressing. (Philadelphia, Pa. Henry Carey Baird, T.K. and P.G. Collins Printers, 1867), Pg. 426. David Jarnagin & Ken R Knopp, Confederate Leather, Black, Brown, How & Where?, North South Trader’s Civil War, Vol. 32, No. 5, 2007, Pgs.,59-65. 9. Campbell Morfit, The Arts of Tanning, Currying and Leather Dressing, Theoretically and Practically Considered in All Their Details, (Philadelphia, Pa. Henry Carey Baird, 1852), pgs, 146-151.